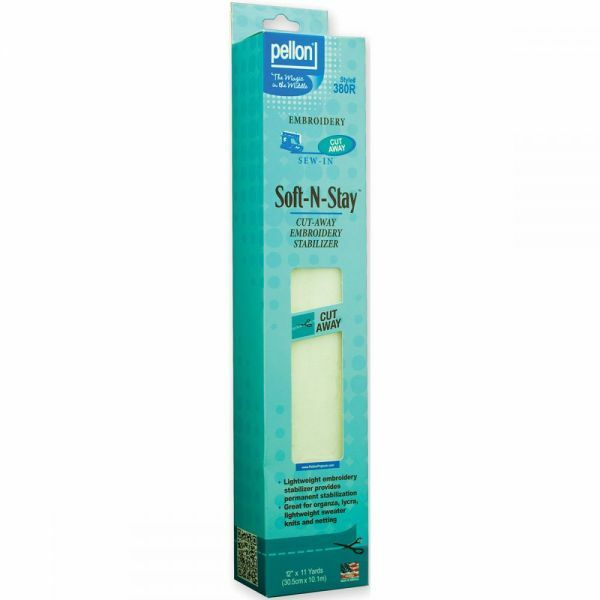 Soft-N-Stay Cut Away Embroidery Stabilizer - PELLON: Soft-N-Stay Embroidery Stabilizer. This lightweight embroidery stabilizer is great for use on organza, lycra, lightweight sweater knits, and netting. It adds permanent body and support to lightweight knits and woven fabrics and offers stretch resistance that eliminates the pulling of embroidery designs. Soft- N-Stay is soft to the touch and provides permanent stability by remaining with the fabric through wearing and laundering. This package contains 11 yards of 12-inch-wide stabilizer. 100% nylon. Acid free. Made in USA.